In Holmatro Rescue Tools, CORE Technology is a hydraulic system that uses COaxial Rescue Equipment hose, couplers, pumps and tools. The CORE Technology system is composed of one hose that consists of a high pressure inner hose surrounded and protected by a low pressure outer hose. The CORE Technology coupler is what makes the coaxial hydraulic hose possible. The couplers have a return valve that is built-in and automatic, which eliminates the need for a dump valve on the pump. The CORE Technology is remarkably FASTER, EASIER, and SAFER, which allows the rescuers to focus on the rescue operation, not the rescue equipment. CORE Technology is considerably FASTER, as you can switch tools without returning to the power unit, and the hose does not need to be unrolled prior to making your connections. 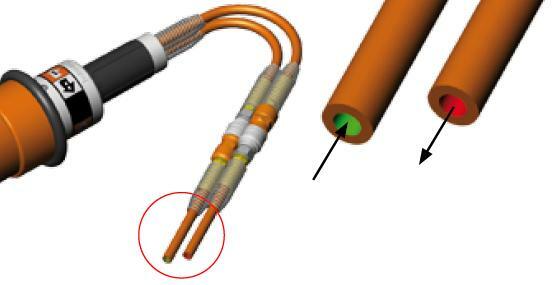 It is EASIER because the male and female connectors cannot be incorrectly connected. The female couplers connect to the tool, and the male couplers connect to the power unit. Icons and arrows are also included to help with quick and easy identification. Both ends of the hose also have 360° swivels that aid in preventing kinking. The hose is SAFER as the high pressure line is completely protected by the low pressure return line. It also does not use any steel wire for reinforcement, which makes it highly flexible and kink resistant. The safety ratio for both the inner and outer hoses is 4:1. Also, since there is only a single smooth hose, compared to the twin line hose, trip hazards and snag points are reduced.